ITIL sets the standard in IT service management (ITSM). Good e-Learning’s ITIL Foundation is a perfect introduction to ITIL, not only covering the basics of ITIL practices but also enabling students to obtain official ITIL Foundation certifications. Contact Good e-Learning today to find out more! ITIL is one of the world’s most popular methodologies for IT service management. It standardizes the procedures for good IT management, covering everything from service strategy to continuous service improvement. Overall, ITIL helps users to create sustainable and consistent IT services which expertly line up not only with the priorities of management but also the needs of customers. 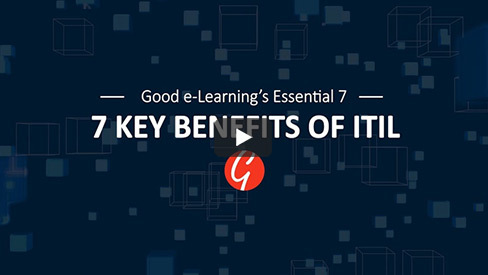 In this video, Mike from Good e-Learning introduces you to the ITIL Foundation course. Good e-Learning is an award-winning online course provider, having created dozens of digital courses in some of the world’s most popular standards and frameworks. The ITIL Foundation course offers a solid introduction to the ITIL methodology, not only upskilling students in ITIL but also ensuring that they are prepared to sit the official ITIL Foundation examination. We even offer a FREE examination voucher, along with 24/7 tutor support to help students along. Good e-Learning has a range of IT service management courses covering the entire spectrum of ITIL V3. In addition to our Foundation course, we also offer Intermediate-level suites for every ITIL Lifecycle and Service Capability module. Finally, the ITIL Expert Certification suite includes every Foundation and Intermediate ITIL course, giving students everything they need to become certified ITIL Experts.